Most known Eocene cricetids are from East and Central Asia, especially China and Kazakstan. The genus Pappocricetodon is considered to be the most primitive cricetid. However, the origin of Cricetidae and the relationships among the earliest species from Central and East Asia are still unclear. Dr. LI Qian, Institute of Vertebrate Paleontology and Paleoanthropology, Chinese Academy of Sciences, identified three species of cricetid, Pappocricetodon neimongolensis sp. nov., Pappocricetodon cf. P. zhongtiaensis, and Pappocricetodon sp. from the basal strata of the Irdin Manha Formation in the Huheboerhe section of the Erlian Basin, Nei Mongol, China. These new specimens display some typical cricetid dental features, and cast new light on the origin of cricetids during the Middle Eocene, according to a paper published in the latest issue of Vertebrata PalAsiatica. These new specimens were collected by screenwashing. 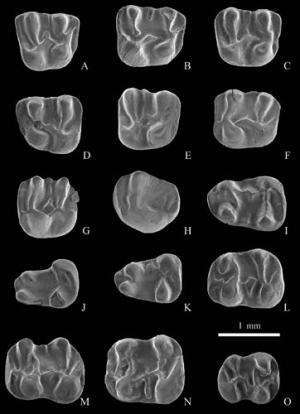 A rich fossil assemblage, including rodents, lagomorphs, artiodactyls, perissodactyls, the primate Tarkops mckennai and the gliran Gomphos shevyrevae, has been recovered from the same horizon, suggesting that the base of the Irdin Manha Formation is Middle Eocene. Pappocricetodon neimongolensis is characterized by the several distinctive dental features. It is more primitive than other species of Pappocricetodon in having a smaller anterocone, a shorter mure and mesoloph, a more prominent hypocone on M3, and a longer posterior arm of the protoconid. Pappocricetodon sp. has a prominent anterior lobe, and Pappocricetodon cf. P. zhongtiaensis has a distinct mesoloph. These fossils suggest that cricetids were already diversified in the Middle Eocene, and probably originated earlier than the Irdinmanhan. Paleontologists usually look for bones, but a mouse is very tiny and its bones are very thin and fragile. The teeth, however, are preserved by enamel. We are very lucky to have them, said LI Qian. More information: Full paper available: Vertebrata PalAsiatica 2012(3).